Three years ago today in the little front range mountain town of Longmont, a perfect buckskin pinto filly was born. This town, miles from where I went to college at Colorado State and an even shorter disxtance from my daughter’s home in Brighton was just the right sort of coincidence I love and cannot refuse. From the moment this baby caught my eye, I was gone. Buckskin being my favorite color and having the breeding and movement to really be a contender for Lauren. We bought her sight unseen. Today, exactly three years to the day, Betty Sue came home from her first trainer. First, Lauren under Trapp’s tutelage is a more confident, precise rider and second Betty Sue while quick and handy was not silly or difficult. Watching Lauren take the mare to the mounting block for the first time and quietly lift over herself over the baby’s back was awesome. I was holding back tears. It’s a big ring for a little girl! Three years!! A fantastic journey for us. 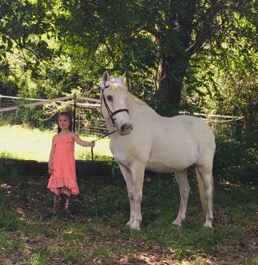 I cannot wait to see where this mare is three years from now! No horse show is complete without one last look at the horse show photos. A team of photographers has spent the entire show; running from ring to ring, catching rider after rider, and jump after jump, riders in their best clothes, in their best position, for their best hopes of winning. And part of the Horseshow tradition is to be inside the trailer where the horse show photos are being exhibited on a computer and picking out your favorites. While I have personally never had the money to buy all the photos of my horse in a given show I know there are a lot of riders that do. Lauren and I pick out one or two maybe three at a really big show and we really gotta love the photo to get it. An individual photo may cost $40 or $50 minimally. 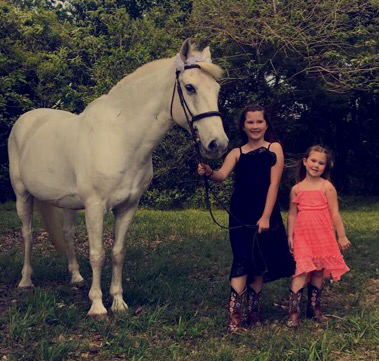 So here are our two first pics from the Pin Oak show -this is Lauren Davis and Stanislaus otherwise known as my Lauren and her Ky.
Lauren headed down our driveway as she made her way over to Nancy’s house. We had determined Nancy had a better location for the photo shoot then we did. Ally is a good planner. In fact, we all are. But because Ally has the two kids (at least in the Texas space) her life spins off its axis a little more dramatically (and a little more frequently) than Lauren’s or mine. 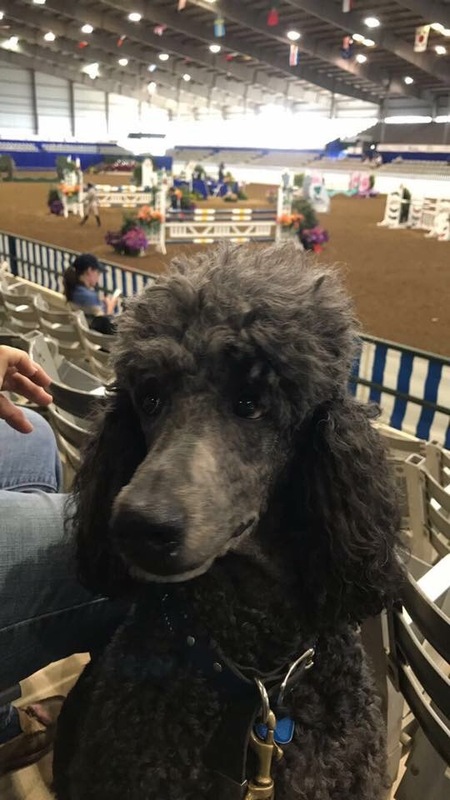 I swear Lauren has been at a horse show for the last 100 years. I am very proud of the progress she and Ky have made as they have scampered up through the divisions. But I also often feel like the wife whose husband is off traveling to the grand destinations while the wife’s is left at home to cook, clean, mow, and care for the animals. And the days Lauren shows here in town just complicate things further as I desperately want to be watching her and the rest of the TKO team, but need to be doing my chores, too. Anyway, what this is all leading up to is that Ally planned for her photographer and friend, Elvia, to come take some pictures of the girls with spring in the air. Ally and I had talked about using Snowboy as we had used big Bruno for pictures back in 2014. Jordyn was about six years old and Kendall had just turned two years old. These pictures ended up being our memories of the last days of Bruno’s life. 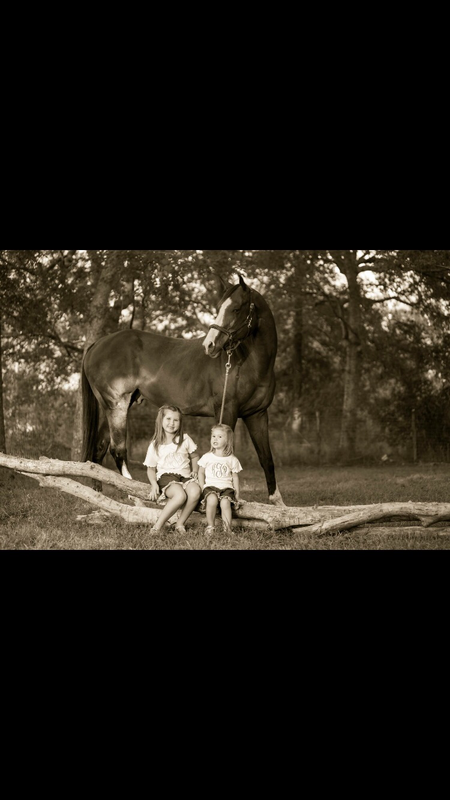 Our wonderful, brave, strong, stoic, giant thoroughbred would die just days after these pictures were taken. And while I was aware of that yesterday, knowing that Snowboy had not been in the best health, never did it stop me from wanting him to be part of the girl’s pictures. And as things sometimes happen he completely brought his best gameface for his photo shoot. Likewise, it didn’t take long for Kendyll and Jordyn to be posing smiling and genuinely enjoying their afternoon. And what we’re left with after our Sunday at Nancy’s house (she graciously allowed us on her property to take the Snowboy pictures) is a print, a simple snapshot of the moment in time. A moment that would be too quickly replaced by little girls were not so innocent and not so easy to giggle at silly things. 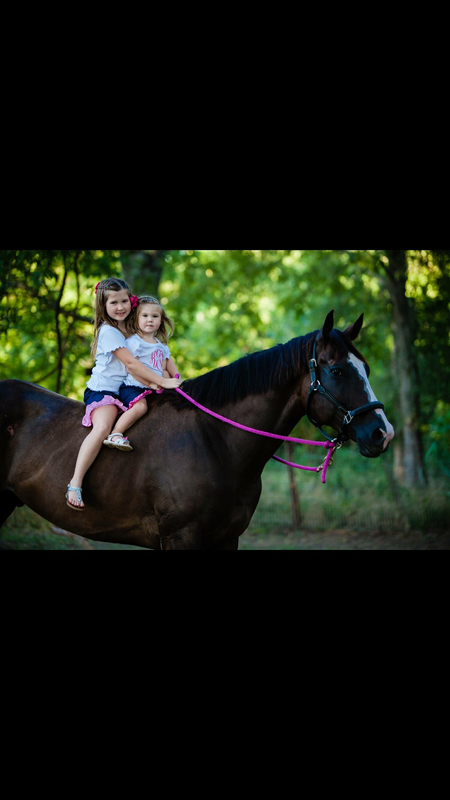 Right now, they are happier on the back of the horse than anywhere else. Big, big thank you to Elvia for these tremendous pictures. And also to my special, wonderful daughter Ally who just does so much for so many of us so often. Thank you Ally for the special day in the sun. As always, thank you for riding along. Last night was the kick off to the World Cup held in Omaha, Nebraska. 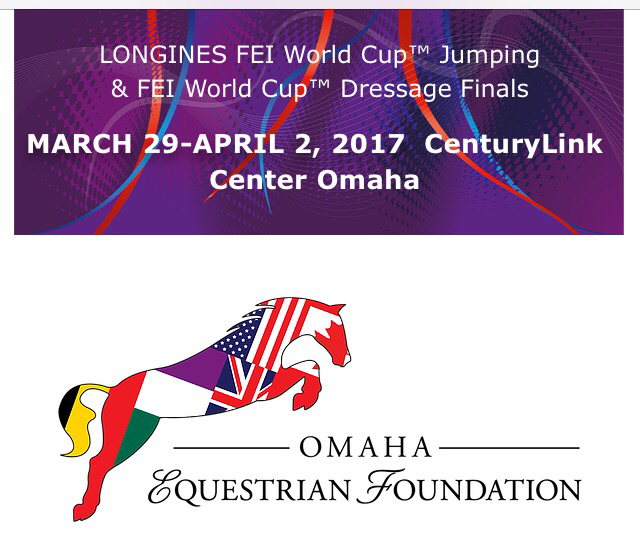 I was invited and declined, stupid me, but my daughter Lauren is actually in Omaha having an opportunity of a lifetime to see the best horses in the world fight it out for the number one global champion. Last night according to US Equestrians Communication department, McLain Ward and HH Azur had won the Longines FEI World Cup™ Jumping Final I (Jumping Speed Class) to kick off the 2017 Longines FEI World Cup™ Jumping Final. 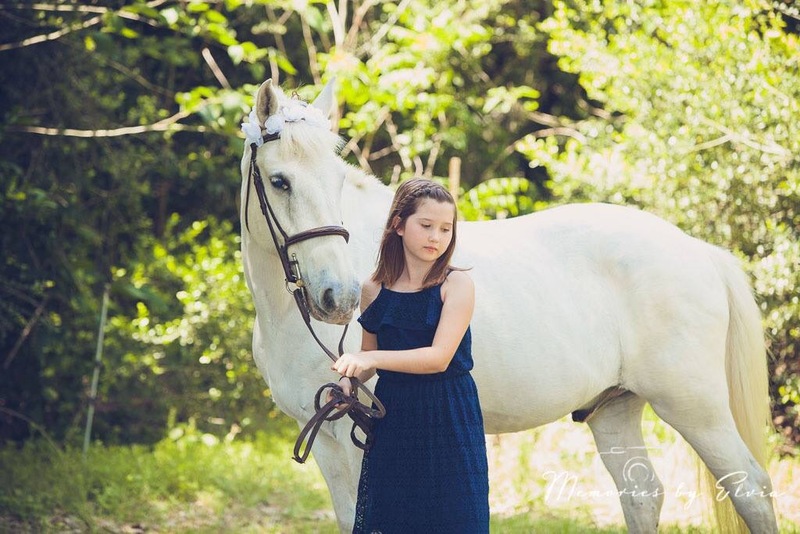 HH Azur is a 2006 Belgian Warmblood mare owned by Double H Farm & Francois Mathy. Lauren sent me this video of McLain’s victory gallop. What a thrill for her to be there. 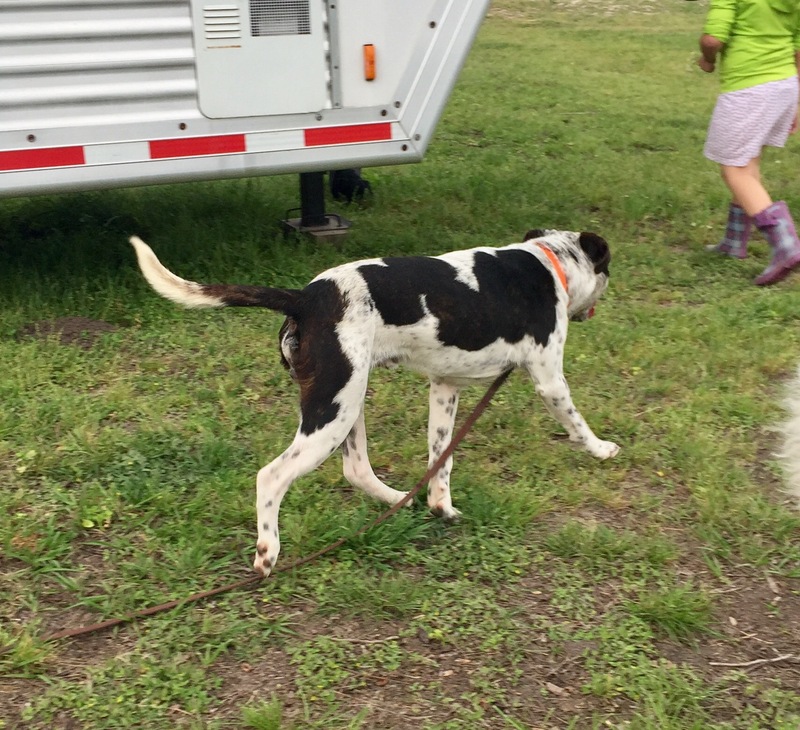 But just saying, back here at the farm, Kona and Lula were having a pretty great time too. Like I said, World Cup or Walmart, either one is terrific. As always, thanks for riding along and go USA in the World Cup. 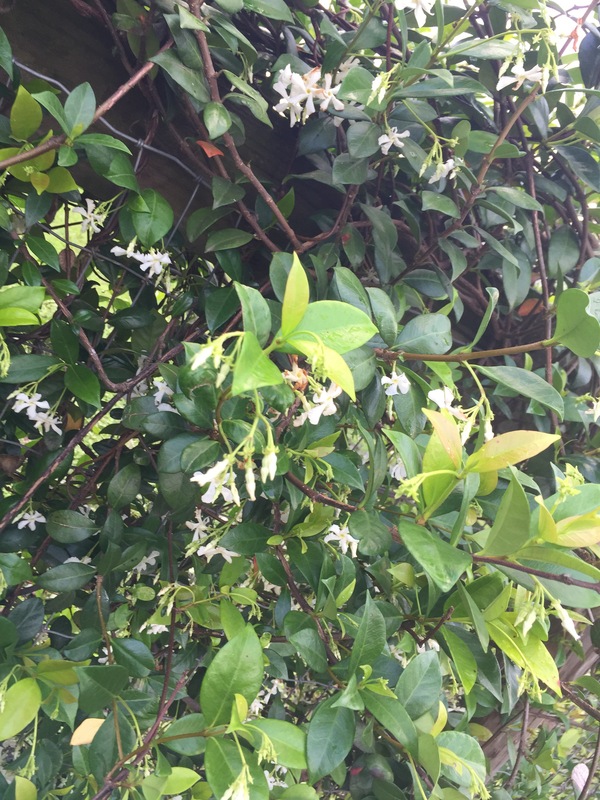 I have loved the sweet smell of jasmine since I first ventured to the south in 1979. I was transferred from Denver to Houston for the first time then. I got an apartment for my dog and I at Westheimer and Gessner. Literally a couple of miles from where I work now. I was 22 years old. One of the very first things I noticed about my apartment was when I came downstairs in the morning I could smell the scent of Jasmine and gardenias floating in the breeze. They were two of my favorite all-time smells and to have them growing right outside my apartment door let me feel like I had landed on an unique tropical island. Houston traffic dissuaded me of that quickly. I left Houston in 1980, moving back to the state of Kansas. Amber was born in Kansas City in 1982. It was not till we all landed in Florida in 1992 that I found the jasmine again. I busily planted jasmine and because everything seems to grow to jumbo height there, we soon had our own jasmine to smell. All three places I have lived in Texas; Sugar Land, Wharton and Richmond, I have planted lots of Jasmine. And while the song Summer Breeze is all about the jasmine, you do not smell Jasmine in the summer in Texas. Texas always trying to be the overachiever, fragrant jasmine blossoms light upon the spring winds of March and April. My grandkids remember the previous springs with delight. Kendyll tonight took some flowers from the vine to let me smell knowing how I would enjoy it. I’m going to stick with summer breeze makes me feel fine, blowing through the jasmine of my mind for tonight and hopefully another month or so. See the smile a-waitin’ in the kitchen, food cookin’ and the plates for two. See the arms that reach out to hold me, in the evening when the day is through. For the first time this year I actually got to be in the same state as my daughter so I could watch her ride! And it was time for them to try new heights. Certainly, Ky has been in the ring before at this height but Lauren never had. 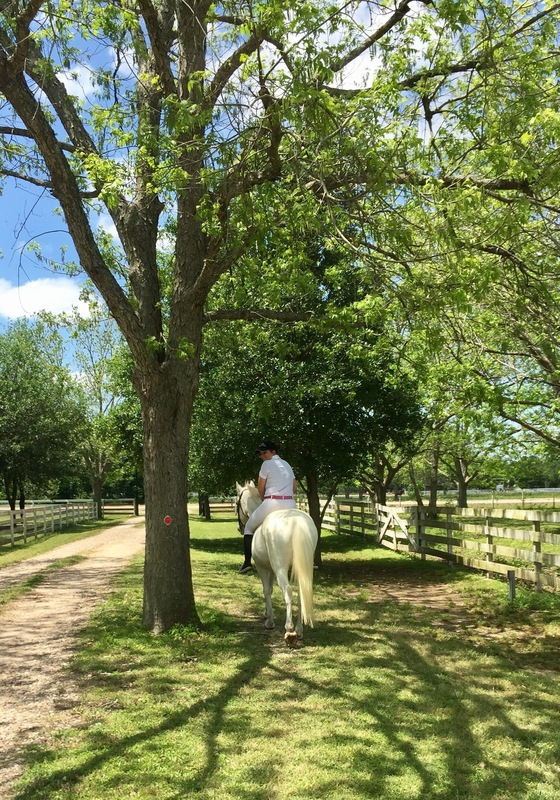 And what better place to try it all out then Pin Oak? (I am being factitious-seems like Pin Oak is the last place you would want to try this). As Ally and I sat in the stands with Kona waiting for Lauren to make her trip, you couldn’t help but notice all the pageantry that goes into this show. Literally hundreds of real plants surround of the jumps. They were making an effort at some toparies and the ones of the giant bunnies scared Kona to death. I can’t even imagine what the horses were thinking of the half green half gray giant topiary horses at the end of the ring. But for the most part the field of horses coming in did a good job. Ally was surprised at the number that was having trouble with the course. Either refusing to jump or pulling the rails when they did. But it is early in the season (for some) just March and a lot of horses haven’t had much time out yet. I was super impressed with the young horses that were jumping quite high this early in the year. 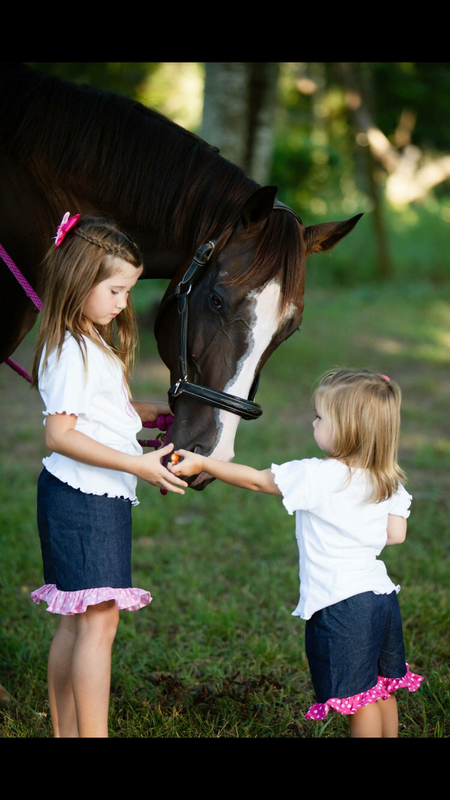 It is our hope that Betty Sue will make this group of elite young jumpers. She has a half-sister who is doing very well in the same field. 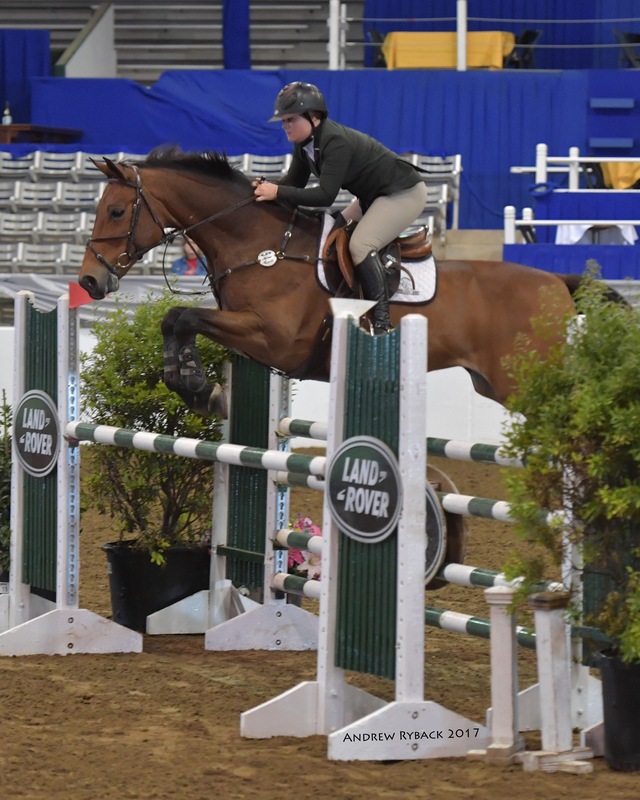 There certainly is a lot between the sound in the stands, the announcer, and the busy, busy jumps for a young horse or any horse to be frightened of here. Anyway, today in Lauren’s class she was clear in her first round. This would let her to move ahead and participate in the jump off. The pair placed sixth overall. Her teammate Sarah, rode very well too, and ended up third overall in the class. 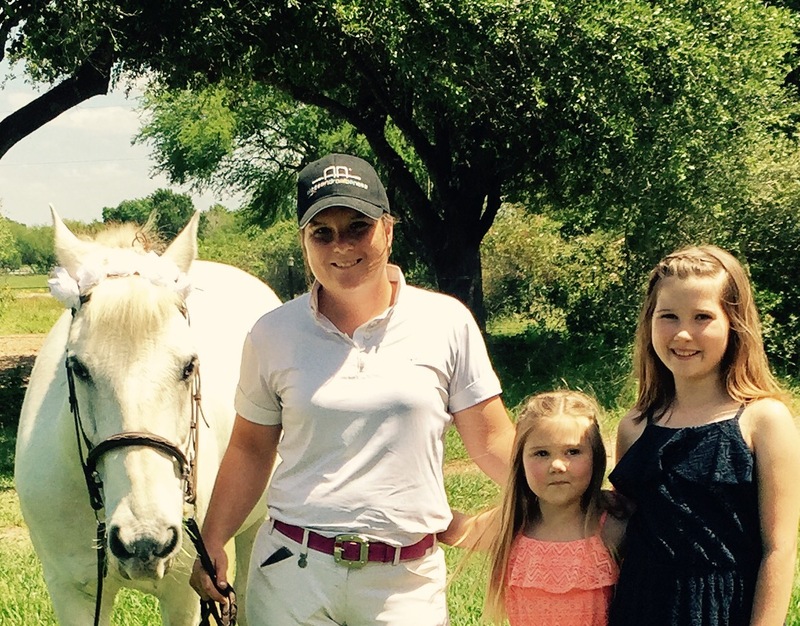 It was a good day for TKO Sport Horses. 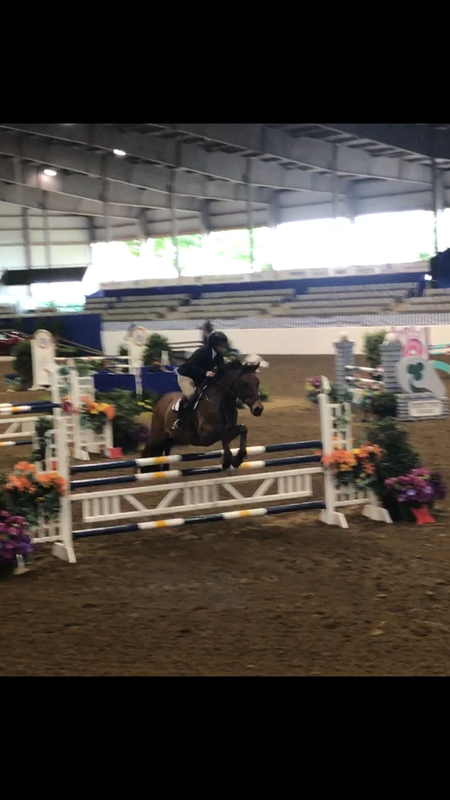 I was thrilled to watch Lauren so professionally guide Ky through the jumps. While I am always nervous watching her I wasn’t as bad as usual. She certainly has grown into a commanding athlete. I can see the months of hard work she has put in paying off. 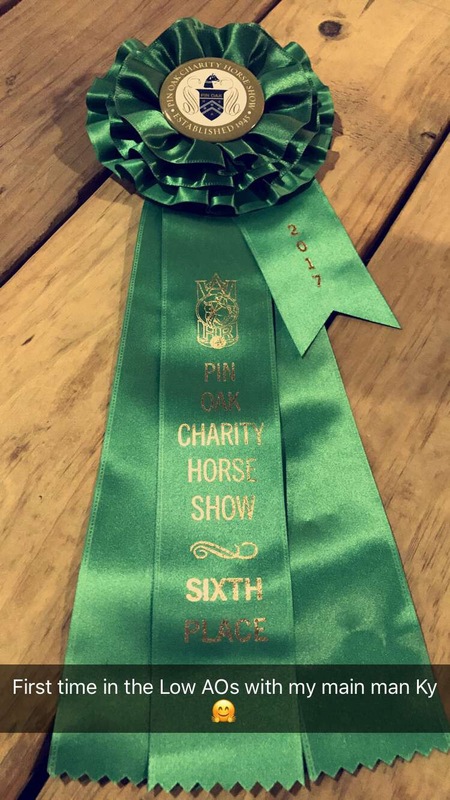 I thought it was a Pretty Great day for Pin Oak, jumping higher than she ever had against other seasoned riders. 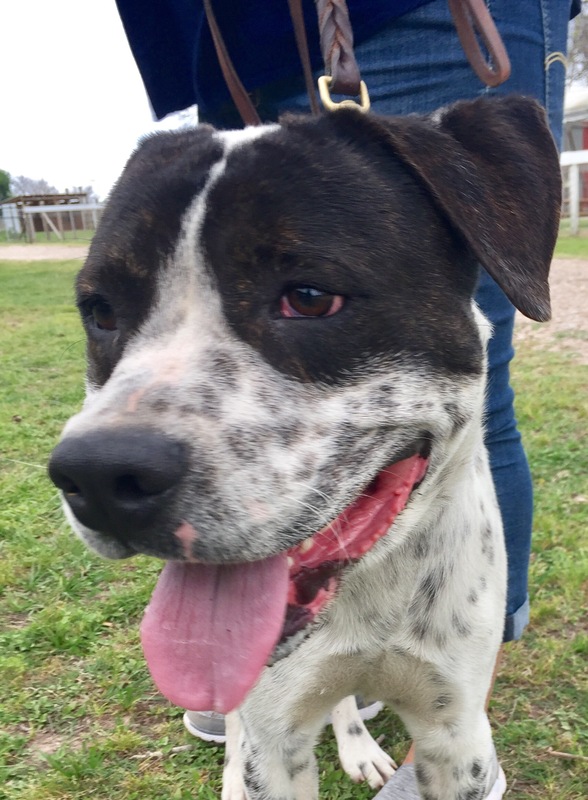 By the way, I have a bird-dog/something with the giant head dog, that I need to get adopted if anyone knows someone interested. Nine-month-old male very cute, very sweet. I had the opportunity to spend time with a friend of mine who seems to have it pretty together in terms of health, fitness, mind and wellness. She gave me what was actually an hour-long lecture on how to be better. The first thing she told me was I needed to fire myself. “Fire myself?” I questioned, “what does that mean?” And she explained it and it made perfect sense . When we overeat, when don’t get enough rest, don’t do our exercise program or any of those things which are not good for us, we always have a reason. At least I do. And my friend was spot on when she said this has got to change. When we go eat that extra candy bar or take that serving of macaroni and cheese or just do not treat ourselves well, who’s making that decision? Of course, it is ourselves. We choose the things we eat, the exercise we get and the hours we sleep. At least for the most part, lacking any detention camp stays or sleep disorders. So let’s change paths for just a moment. What if you had an employee that worked for you and they continually failed to follow the rules and continually stepped outside the lines. What would you do? We would fire them! And don’t we do just the same in regard to our own health and wellness? I certainly step outside the boundaries that I know have been drawn for me. I don’t do the right things in terms of eating, exercise and sleep (I try!). My friend was suggesting we fire ourselves and become newly hired employees learning to listen to our bodies (our bosses) all over again. At some point in my life and I hope to God it’s now, I need to decide to treat myself well. I need to be my own best manager. I can be successful at work. I can successful in my home life but if I’m not successful at handling my own health and well-being than who will be? My friend suggested that I write down exactly what I expected of myself. Kind of like an employment contract. And then I hold myself to being the person I want to be. Sounds so simple and yet I know it will take a lot of work for me to do this. Just this morning the candy basket came around and I actually paused for just a moment and thought about is this the right decision for me. But I still reached in and took a small chocolate. My wise friend would say that’s OK . This is an about treating yourself right, not denying yourself everything that you want. Instead of gobbling down that candy bar quickly because you just had to have it, she suggested sitting down, taking a moment and savoring the candy bar. If it’s that important to have it, give it some quality inspection with your taste buds. Make each decision, each bite, each meal, a deliberate path. I know you may have heard this all before but something rang true in hearing it put this way. It was like she knew exactly what I needed to hear at this point in my life. I am going to start listening to my boss! I am going to fire myself and start all over. I hope I do myself justice this second time around.